One person was killed and two were injured in a shooting that took place Saturday on Mission Street between 17th and 18th streets, police said. Patrol offers heard gunfire and responded to the scene at around 8:45 p.m., according to SFPD spokesman Officer Joseph Tomlinson. When the officers arrived, he said, they found three gunshot victims. One was declared dead at the scene, and the other two — one with life-threatening injuries and the other with non-life-threatening injuries — were transported to the hospital. The suspects are still outstanding, Tomlinson said. He could not provide further information on the identities of the victims. One witness was working a nearby bar when she heard around seven “pops.” “I thought they were fireworks,” she said. A resident of an SRO across the street said she recognized the victim. “I don’t know his name, but he was a nice guy,” she said. She said he didn’t live at the hotel, but frequently visited Mission Street. “He would come through with his daughter,” she said. At around 9:45 p.m., police had blocked off Mission Street between 17th Street and Sycamore Alley. A body was covered up in front of the Footwear City Express shoe store, and around seven evidence markers were strewn in front of the One Dollar Store. Over in front of the Sycamore bar, a minivan sat with a bullet hole on its windshield. Its back window was shattered. 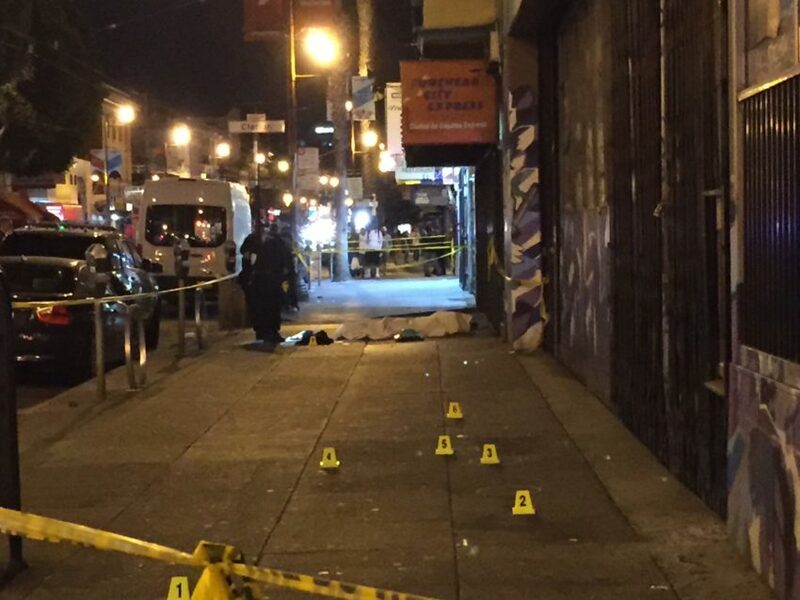 This is the second fatal shooting in the Mission in two weeks. Last Friday, one man was fatally shot and another was injured on 24th and Harrison Streets. Update 7/2/18: As of Monday, the Medical Examiner has not yet released the name of the person who died. On Sunday morning, an altar was set up near the scene. “Rest in Peace, Marcos,” a sign read. There were pictures of a man and his dog, and a pair of sunglasses hung from the sign. 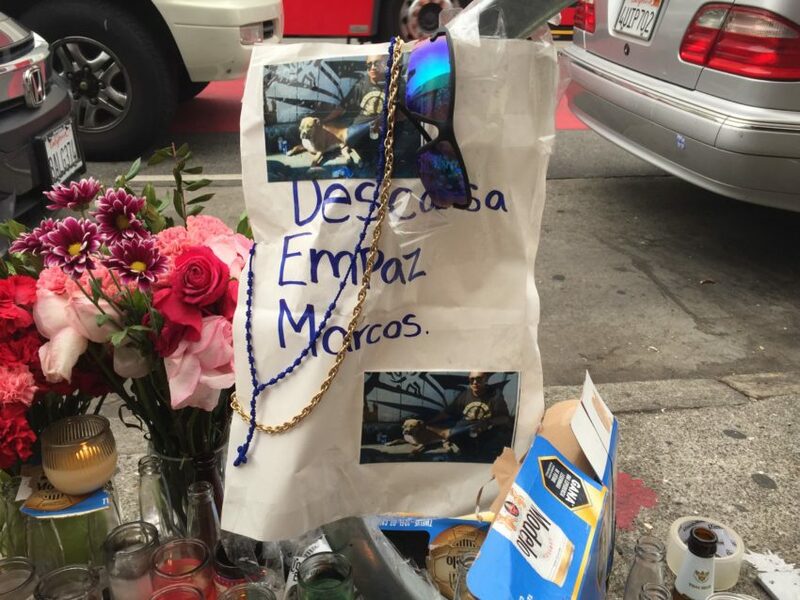 “Rest in Peace, Marcos.” Altar at 17th and Mission streets. Photo by Julian Mark. Yet another deadly shooting in the Mission. Thank God Calle 24 has resisted gentrification and things are staying the same in the Mission ! Gentrification of course is the only way to change the crime, filth, and dirt that plagues the mission. Calle 24 has been useless in making things better and seems to have a vested interest in keeping things the same. Shame on them. No reversing hundreds of years of racism and discrimination will improve opportunities for all and then you wont have young people leaving poor countries whose resources have been exploited by U.S and European capitalist and in result leave little for them. This pushes some people to come here to make money illegally. People here have to start learning whats going on globally impacts us locally and stop scapegoating organizations which are trying to fight for people’s rights in this community. Why is there hardly any info on this? 3 people shot at 8:30 on a busy, major st & it’s buried in the sfgate. I was right there & I’d like more info. The cops were there pretty much as soon as the bullets flew. I couldn’t even tell if it was a drive by. The Mission is considered a “Containment Zone” where drug dealing, gang activity and other “quality of life crimes” are tolerated. In fact, the Progressives are currently in process of dismantling SF’s gang injunction that was put in place to discourage gang activity in the area. There is no political will to curtail violence in the mission because the opposite of gang violence is gentrification, which is anethma to the progressives in power. The so-called progressives are making things worse. The horrible David Campos didn’t care about quality of life issues and Hillary Ronen may not be much better. We need a stakeholders (renters, homeowners,business owners) revolt against these destructive progressives. Throw them out of office and get the supes to act on the people’s will. Hey Mission Local – Please keep us updated on the investigation. Why so little info on this triple shooting? Still no identifications or info about who & why. Please update!